During winter you will most likely ride your horses less and less, which makes it a perfect time to care for their hooves. Probably the best way to begin winter hoof care is to pull the horse’s shoes – depending on the terrain where the horse is kept and the overall health of the hooves - to give the hooves some time to thicken, to permit for heel expansion, and to increase the circulation within the hoof capsule. Keeping a horse without its shoes is often referred to as “letting the horse go barefoot” and while this is a desirable option in the winter, it also requires special care for the animal’s hooves. For example, while you remove some of the sole when applying shoes to the hooves, when the horse goes barefoot, you will want to trim the hooves differently. Do not remove the sole and leave more of the hoof wall, which will be rasped by starting outside the white line. The result will be a hoof with a surface that is rounded and therefore protected from chipping, cracking and other injury. Even though the hooves do not grow as quickly in the winter as they do in the summer, it is still important to keep up with regular hoof trimming, painting, and dressing. While you may believe that allowing the horse to go barefoot in the winter will decrease the care the hooves need, the opposite is actually the case. In some cases you will not be able to allow your horse the luxury of going barefoot. This may be the case if you are expecting to still ride your horse during the winter. In this situation you will need to take extra care to accommodate the hooves to remain healthy during freezing temperatures. 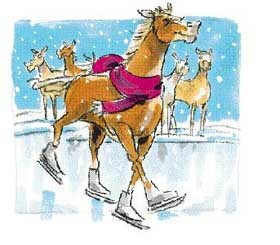 You may choose to add pads under the horse’s shoes, which eliminate the risk of sole bruises because of the frozen ground. A snowball pad, which will avoid snow packing under the hooves, will need to be used if you are expecting a lot of snow. Some horse owners use flat plastic pads sprayed with cooking oil, but the oils are known to wear off rather quickly. More useful is the bubbly snow pooper pad which simply prevents snow build up. Rim pads made of rubber or more durable plastic dislodge any snow build up. If your area is susceptible to ice and snow, the shoes should be changed to permit for the wearing of shoes with a crease, and substances that assure added traction to prevent slipping and subsequent injury. There are different options with respect to offering added traction to your horse via the shoes. You may consider using borium, which is a resilient surfacing material. Application of this substance to the shoe needs to be done sparingly in the heel, avoiding large portions on the bottom of the shoe which will only stress the hoof unnecessarily. Another option to offer traction to your horse’s hooves is to use studs or ice nails. Studs may be driven in on a permanent basis, while screw-ins will provide temporary traction. Ice nails simply replace the already present heel nails, and a borium bubble on the head of the nail provides the traction. This latter option is probably the least functional. It is usually suggested that horse owners stay away from snowshoes for horses simply because the build up of snow underneath the foot is a health hazard to both horse and rider. Add to this the fact that thin-soled horses may quite possibly experience adverse reactions to these shoes such as bruising, and you will understand why it is probably best to not to choose this option. Read the next horse shoes article on Hoove balence Hooves through Angle.